Another gorgeous Valentine set from Live Love Polish to show you! This is my first time trying out Colores de Carol can you believe it? This trio includes two best sellers and one Live Love Polish exclusive. 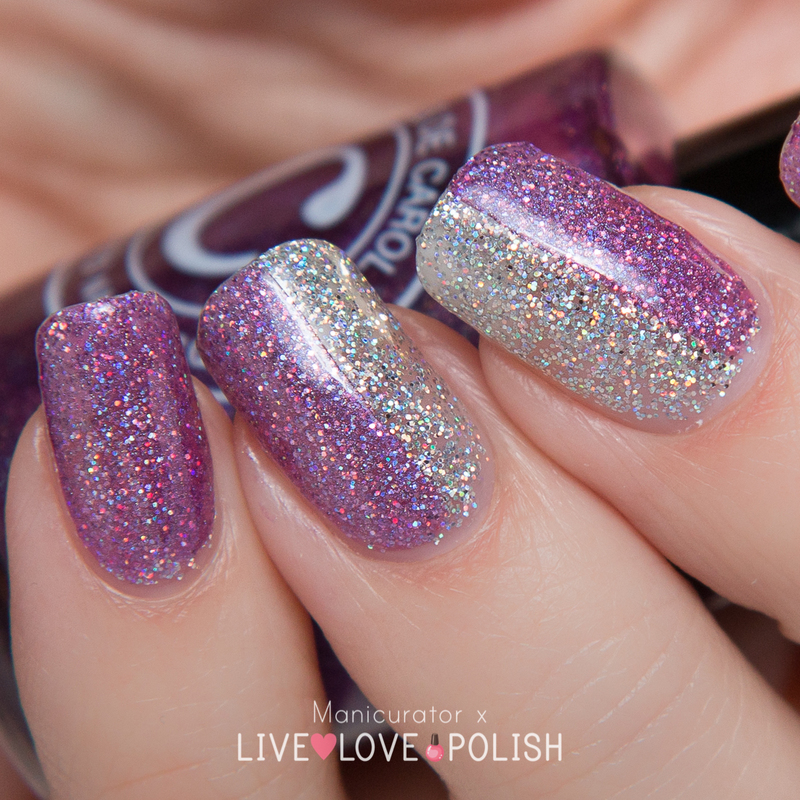 Colores de Carol Bling a clear base with micro holo glitter. This all out holo goodness is amazing to see in person! I needed 3 cts for this level of opacity so this would also work well as a top coat. Colores de Carol Amethyst a linear holographic medium purple with blue shimmer. I noticed the jelly-like formula of this polish at first swipe so I wanted to experiment. This is one coat of Amethyst over Bling and it's an amazing combo. Great formula which had excellent smooth and non-patchy coverage with just one coat. Cool, right? Colores de Carol Jesse's Girl - an eclectic mix of glitters, truly unique. A Live Love Polish exclusive. Wasn't sure how I felt about this one in the bottle, but look at this combination up close, it's so fun!! I chose to pair it over China Glaze Wanderlust from the new Road Trip collection. Colored de Carol are available at livelovepolish.com for $10.00 or $12.00 each and $30 for the trio. Beautiful swatches Victoria, I'm glad to know you like them! Very nice colors in this set! Your nail art is amazing! It's such a perfect and simple way to showcase those two shades. And I love bling so much! Bling looks beautiful <3 I love looking at your swatches, Victoria. Jesse's Girl is such a cute and fun shade! Both designs are lovely, I would totally be into them! I'm into anything with glitter. These are all GORGEOUS! I also really liked the combo you created. You have some genius layering happening here!